simple IC 555 based buck converter circuit. We can see two pots, the upper pot optimizes the buck frequency, and the lower pot optimizes the PWM, both these adjustments could be tweaked for getting an optimum response across C.
The BC557 transistor and the 0.6 ohm resistor forms a current limiter for safeguarding the TIP127 (driver transistor) from over current during the adjustment process, later this resistance value could be adjusted for higher current outputs along with a higher rated driver transistor. 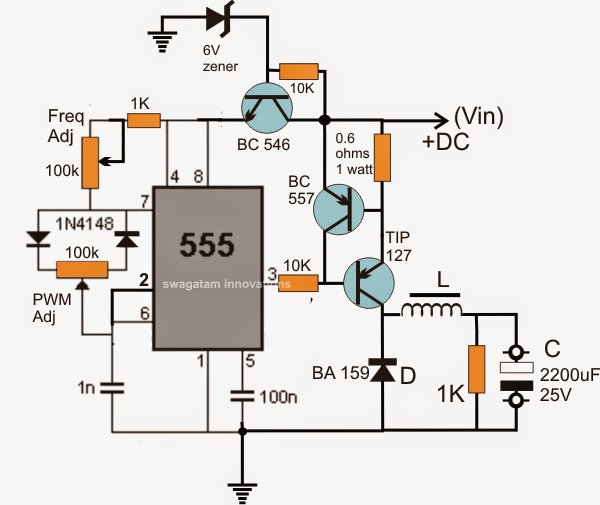 1 Response to "Solar Inverter Circuit Diagram By Using 555 IC Timer"